. إن الخدمات الممتازة وحسن الضيافة العالي في Crystal Bay on the Broadwater تجعل إقامتك تجربة لا تنسى. يقدم هذا الفندق العديد من الخدمات الكفيلة بإرضاء أكثر الضيوف تطلباً. في الفندق غرف نوم يتجاوز عددها 70، كلها مجهزة بعناية وجمال وبعضها مزود بـ تلفزيون بشاشة مسطحة, سجاد, مرآة, صوفا, اتصال لاسلكي بالإنترنت. كما أن مجموعة الخدمات الواسعة الموجودة في الفندق لضمان راحتك تترك لك الكثير من الخيارات لقضاء وقتك أثناء فترة إقامتك. اكتشف مزيجاً ساحراً من الخدمة الاحترافية والخيارات الواسعة من وسائل الراحة والمتعة في Crystal Bay on the Broadwater. The units are a short drive to SeaWorld, Surfers, and an excellent park with heaps of play equipment. It isn’t really in walking distance to anywhere, but that is ok. The view was absolutely beautiful. The room facilities are dated- the appliances are old and there are bumps on the walls. The carpet was also old and worn- HOWEVER, The rooms are spacious and the price is excellent. Great for families of young kids! Place was really clean and beautiful. Location was also pretty good, about 15mins drive to Surfers Paradise. Staff at the reception was friendly. Hassle free check in process. Apartment was really big. There were a total of 7 adults for this trip. Hence space was really an issue for us. But the rooms was pretty good size. So no complaints there. Place was also peaceful and not noisy at all. There were even fireworks at one of the buildings nearby during our stay there and it was amazingly beautiful. Overall a good experience staying here. Thumbs up for this place! Good location; Value for Money; Great View. I am glad someone posted comments about issues with after-hour check-in on Sunday. That helped me to contact the service provider in advance and saved me a lot of hassles. Overall had a good stay at the apartment. The place is conveniently located especially if you have your own transport. Nice park in front with sea view. One area for improvement is to provide fans in the rooms especially when the weather gets too hot, as there is only one aircon unit in the living room, so we have to leave the room doors open to get ventilation. Beautiful views from balcony, great spa and pool area, close enough to shops and theme parks. Very clean and updated room with great air conditioning. Hotel staff is helpful & friendly. Hotel room is spacious & clean, with nice sea view scenery. We have stayed here last October 2016. The place is great and location is nice just like 5-7 minutes drive to Surfer's Paradise. There is only an aircon in the lounge hence it can be warm inside the rooms but nonetheless great value for money. I went to stay there with 2 families with kids. The location is great and close to theme parks. One big issue is that the bed room and bath rooms have no locks. Its quite irritating that there is no locks in bathrooms and dont know if any one else will walk in the toilet when one is using it so its not family friendly option specially if traveling in group or with kids. Also surprisingly the master bedroom does not even have an air condition or a fan. Also there is no room cleaning or make over service so if staying for longer than a day one has to do all the work on holiday. Quite disappointed. If you have a large family I would recommend going for an apartment. Location is perfect if you are heading to theme parks, staff are friendly, parking available for vans and larger vehicles in the basement. We also had a good portable cot given to us by Hotel. All up, we had an amazing time and are VERY likely to return to Crystal Bay in the future. we enjoyed a nice break here the accomodation is older and room perhaps could do with painting and new carpet. we enjoyed the view from the 10th floor looking into gold coast with a good size balcony lovely with the nighttime lights. We stay 7 nights but there was no linen change or room freshened up during this time which is disappointing as clean linen would have been nice and I thought normal practice. easy to walk around the water front but will need to drive into gold coast if wishing to frequent more restaurants. pool area nice with good gym, sauna and steam room. I had a very enjoyable stay at crystal bay in a very spacious apartment with nice views and a great position. The apartment was very clean had a good kitchen big tv with all cable channels comfortable bed and good bathroom. I will be back enjoyed very much. Comfortable and cosy apartment with a kitchenette, all cutlery included, washing machine, dryer and ironing board too. Overall experience is wonderful and would recommend to couple/ family. Location is 15 mins by car to surfer paradise beach. 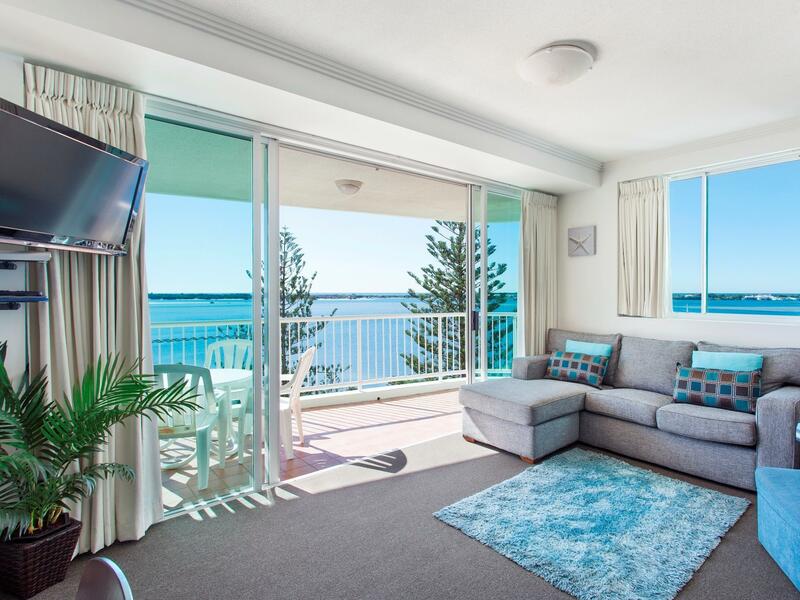 We thought the hotel exceeded our expectations.We choose Crystal Bay initially for it's location quiet but only a short hop to Southport and Surfers Paradise. 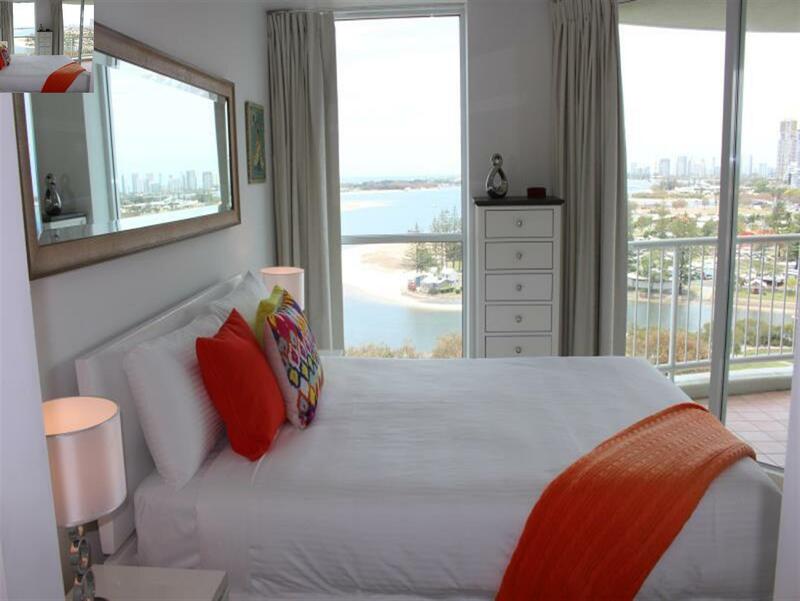 The views over Broadwater wher beatiful, the room was clean well equipped and spacious enough. We had a really enjoyable stay. This suited our needs and budget, the apartments were spacious and layout was ok. I wouldn't say it was up to standards with cleanines I had to ask for our shower to be cleaned upon arrival. I wouldn't let this deter you from staying it was considerably cheaper than others around and had good facilities. Great views. Friendly staff. Clean amenities. Amazing. Great facilities and close to everything. Quiet but that’s waht you need on a holiday. Very helpful staff, clean and tidy, within a short travel distance to everything required. Nice quiet location. Would recommend to fellow travelers. Clean, well equipped apartment with lovely views. Well equipped gym, table tennis, sauna, spa and pool ideal for our teenage sons. Will return and recommend to others. Awesome place, the apartment had all the facilities, close to everything, value for money.